The ambassador in charge of International Cooperation for Countering Terrorism and International Organized Crime related issues, from the Ministry of Foreign Affairs, Eiji YAMAMOTO made a presentation on Japan`s contribution efforts regarding the issue of international terrorism on the 22nd of September at the JICA Global Plaza Building in Ichigaya, Tokyo. The presentation was followed by a Q&A session, which led to a lively discussion among the participants. First of all, data on current international terrorist activities was presented and analyzed using graphical representation. The peak of international terrorist activities in 2014 can be explained by the unilateral declaration of a world caliphate by the infamous terrorist group so-called Islamic State (ISIL). 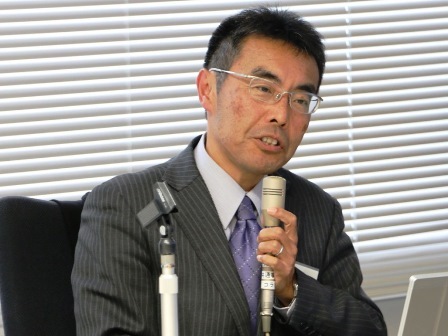 However, apart from the fact that the number of deaths caused by terror incidents seems to be decreasing after its climax in 2014, Mr. Yamamoto has pointed out three important developments: (1) Despite the decreasing trend of terror incidents since 2014, if put into historical comparison, the total number of deaths caused by terror attacks has tripled since 9.11. (2) Contrary to the overall decrease of terror incidents in South East Asia, the total number of deaths induced by such incidents has increased, indicating that terror attacks in South East Asia have become more lethal. (3) After 9.11, OECD countries have also become a target of terrorist attacks and have reached their climax in terms of the number of terror incidents occurred. Ambassador Eiji Yamamoto’s concluded that the data supports the fact that the issue of terrorism has crossed the borders of the top three countries of terrorism occurrences: Syria, Iraq and Afghanistan, and has reached the stage of an international issue. Second, he addressed the question of ‘’who’’ the actual perpetrators of terrorism are. Three categories were pointed out: (1) Foreign Terrorist Fighters (FTF), who return to their countries or move to third countries. The ambassador indicated that the increase in number of deaths from terrorism in South East Asia can be traced back to the extremist fighters who have been fighting for the IS in Iraq and Syria and returned to their home countries. ‘’The damage caused by terrorism is also growing due to the strengthened fighting power of foreign battle fighters getting over to Southeast Asia, especially in Malawi City (Philippines) after being forced to flee to the area and guiding the local armed forces’’, ambassador Yamamoto explained. Despite of the fact that this brings the whole issue into Japan’s regional proximity, ambassador Yamamoto points out his uneasiness concerning the fact that it has not been reported at all. (2) The second type of perpetrators who were pointed out were so called ‘’Frustrated Travelers’’, individuals who commit terrorist attacks in their home countries out of frustration that they cannot participate in the battlefield to fight alongside ISIL. Furthermore, after listing violent extremism as one of the root causes for the occurrence of such trends, the ambassador highlighted that despite the fact that extremism has existed for many decades, recent acts of extremism have merged with violence and became Violent Extremism. The internet, Improvised Explosive Devices (IEDs) and their nexus have been mentioned as a trend that should be concerned. For example, the internet is being used for propaganda purposes to conduct terrorist acts with utilities available to anyone such as cars and knives. In addition, the internet is also being used as a platform for instructions for IEDs, which have a relative high lethality level, therefore a huge concern has been growing. Furthermore, FTF and “frustrated travelers” continue to be influenced through propaganda on the internet and active on terrorist attacks, despite IS has reportedly lost 99% of the dominant area. Although discussions among experts are being conducted regarding the internet, while some hard liners argue that “all the harmful web sites should be shut down with a force”, others believe that “according to the principle of freedom of speech and democracy, counter measures should be conducted voluntarily through the cooperation of internet providers as requested byauthorities in charge”. Next, the explanation of ‘’Comprehensive Approach’’ conducted in response to the question of ‘’What should Japan do?’’ to counter international terrorism. This approach consists of three items: (1) support for improving terrorist coping capacity, (2) socio-economic development assistance, and (3) counter measures against violent extremism which Japan supports. The detail implementations of above three items include: (1) the implementation of reinforced border management, in particular, technical cooperation such as strengthening the use of INTERPOL databases. This shall help to build capacity of customs authorities, provide biometric authentication system, etc. and is currently being carried out. For example, 2018 A face recognition and behavior detection system was provided to the main stadium in the Asian Games and Indonesia, and training was given to the airport security officer in ASEAN member countries to use the same equipment. (1) As assistance to former Al Shabab and IS fighters and with the perspective in mind that young people are participating in such groups partially as a result of seeking income, support systems to create stable employment and income for the society are being provided. Finally, root causes are being tackled by (3) promoting moderate religious education and strengthening the role of women through the opportunity to invite Madrassa (an Islamic religious school) to Japan, for the purpose of prevention of violent religious radicalization. Such ‘’comprehensive approach’’ measures can be implemented based on the formation of an information sharing as well as political will by multilateral frameworks such as UN agencies, G7, GCTF (Global Terrorism Countermeasure Forum), ASEAN and so on, as well as through bilateral cooperation and support through international organizations. Last but not least, Ambassador Yamamoto provided the following two points as advice to not get caught up in terrorism. The first thing is to recognize that the era in which Japan is not a target of terrorism, has ended. The fact that Japan is repeatedly being reported as being an enemy by ISIL’s information sources and that Japanese individuals have encountered terrorism at Dhaka (Bangladesh), shows that the possibility of Japanese becoming a target of ISIL exists. Additionally, as there is also the potential of being taken as hostage, it has been advised not to travel to countries where the occurrences of terror attacks are high. Following the presentation from the Ambassador YAMAMOTO, Prof. Ai Kihara-Hunt of the University of Tokyo stated that the profile of ‘terrorists’ that emerge from Japan’s policy is ‘young foreigners with Islamic belief, coming in across the border, in particular from the Middle East and Africa’, and suggested that Japan needs to be able to respond to a variety of ‘terrorists’ and ‘terrorist acts’, and to look into various frustrations inside the country. She also asked what regional framework may be in place or in the making. 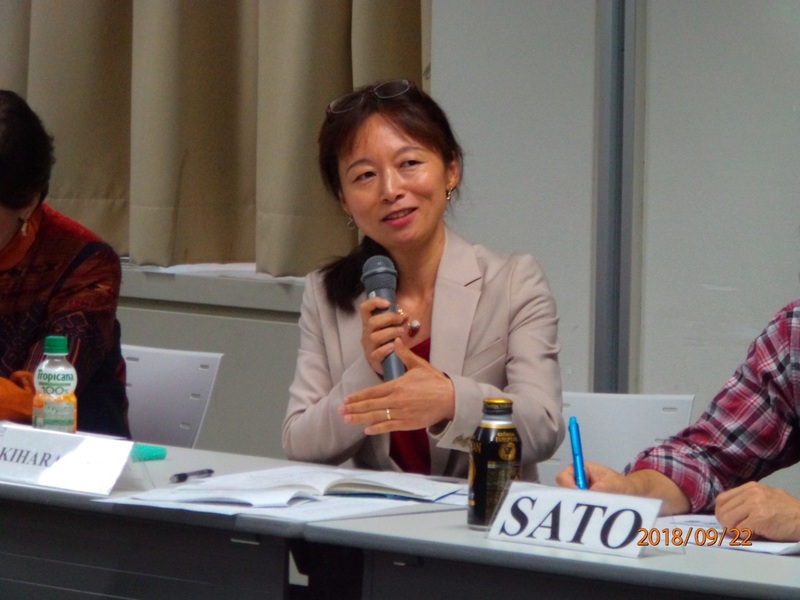 Next, she asked in relation to root causes, how Japan’s policy of supporting non-violent expression and tolerance abroad is related to its domestic policies. In regards to human rights, she pointed out that (i) the right to privacy needs to be fully protected in obtaining information, in the use of surveillance cameras and information given from internet providers (two main sources according to Japanese National Police Agency) even in getting information for the purpose of sharing with other States or INTERPOL, (ii) peaceful exercise of the right to freedom of expression must be fully protected in order to tackle terrorism, and not the other way around, (iii) human rights standards need to be fully observed before sanctions are put in place against individuals or groups, internationally and domestically, and (iv) expression and actions that promotes supremacy of a race over another or that encourages attack against certain race or religion need to be criminalized and sanctioned. 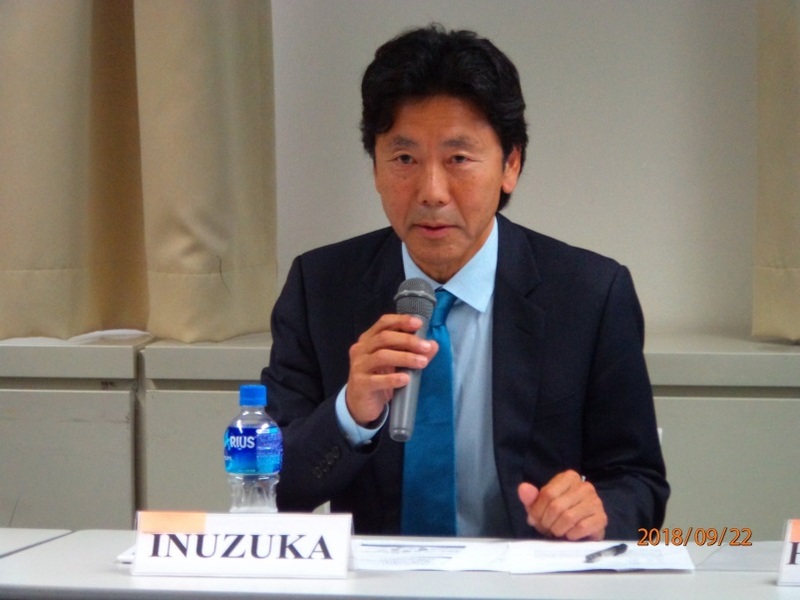 The former senator of Japanese National Diet, Tadashi Inuzuka expressed strong support for MOFA’s “Integrated Approach” illustrated as invitation of the Afghanistan madrasa students to Japan for cultural exchanges. As an example of such an Integrated Approach from legislative bodies, the Draft Law on Elimination of Terrorism in Afghanistan (January 11, 2008 upper-house law13, later refused by the lower-house) was introduced. To further develop an integrated approach, the establishment of a HRTF (Humanitarian Relief Task Force) was introduced, as much needed HA/DR efforts in Asia Pacific area, as a UN Chapter 8 Regional Arrangements, which is multi-national civil-military arrangement, deployed upon the consent/request of the affected nation/area, as a Japanese effort in search of peacekeeping methods that reflect the standards of the 21st century. 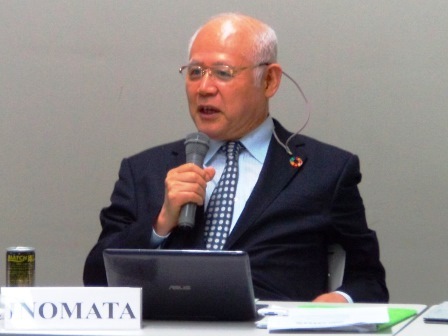 Mr. Tadanori Inomata, Former Ambassador in Costa Rica and Advisor for Global Relations of Nagasaki university, asserts that there is no official definition of terrorism, but in the General Assembly of the United Nations it is recognized as “criminal acts to create a state of terror in the general public or a specific group for political purposes” (Assembly Resolution 71/151 paragraph 4). To expand support for self’s assertion, terrorism try to create unrest and fear to the world through violent acts. Therefore, it is essential to raise the social resilience to it. He suggested government policy measures for it. On the other hand, fortunately, such resilience is high in the Japanese society, which respects human affinity, raising the question how that can be utilized to serve international capacity building. 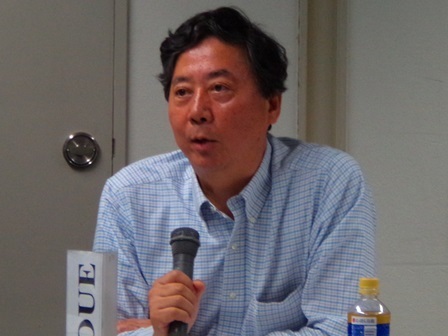 Professor Katsumi Ishizuka at Kyoei University pointed out the definition of terrorism has expanded. In the 1990s, the definition of terrorism was clear, which was “the violent and non-humanitarian behaviors for achieving political aims.” However, in the post 9.11 period, non-political crimes, such as non-discriminatory shooting, have been defined as terrorism as well. Meanwhile, it is generally accepted that the Taliban have been regarded as terrorists. If so, why has ethnic cleansing which happened in Rwanda and Bosnia in 1990s been not been defined as acts of terrorism? Furthermore, it is noted that MINUSMA, the UN peacekeeping mission in Mali, has been regarded as counter-terrorism operation, simply because its mandate includes the protection of citizens from asymmetric threats. If the term of “terrorism” has been thus unnecessarily and frequently used, the Japanese policy towards UN operations would be more passive. 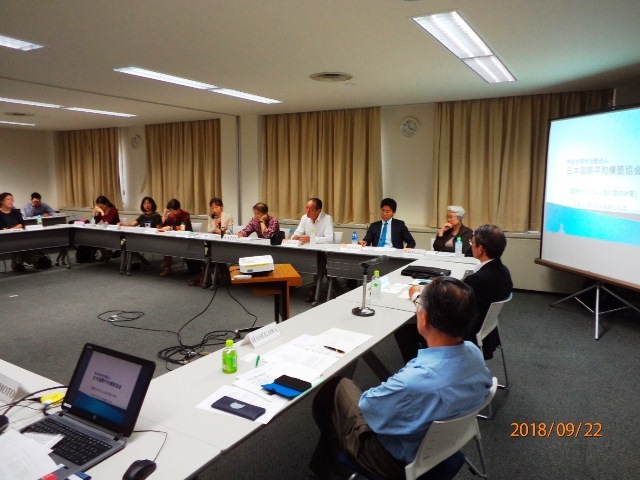 Mr. Ken Inoue, Senior Advisor on Democratic Governance of JICA stated that as had been discussed, there was no agreed definition of terrorism, thus, no crime called terrorism. He asked if we could call indiscriminately murder for fun terrorism. In his view, the issue was not “international terrorism” but just “international crimes”.He also posed other related questions. Regarding security for the Olympic and Paralympic, if the resources are limited, which should we protect first buildings for the games or life of the people? The government is restricting visit of Japanese people to other countries based on the security guidelines, but is it appropriate to mix up student tourists and experienced experts? Risk should be properly assessed and the guidelines should be more specifically determined based on areas within a country and/or purposes of visitors. 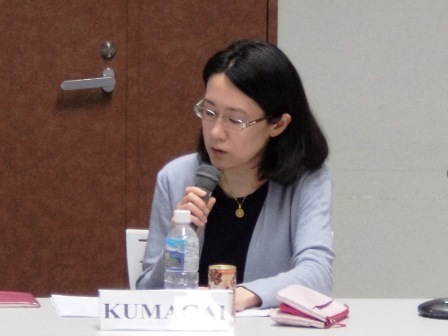 Associate professor Naoko Kumagai at International University of Japan commented that Japan can strengthen its diplomatic efforts for international cooperation for counterterrorism. For the prevention and solution of any problematic measures in view of international humanitarian law, such as the Guantanamo Bay detention camp, Japan can facilitate multilateral cooperation for more effective rule of law in international society. This is important particularly since counterterrorism measures that are problematic in terms of international humanitarian law also generate the vicious cycle of terrorism. 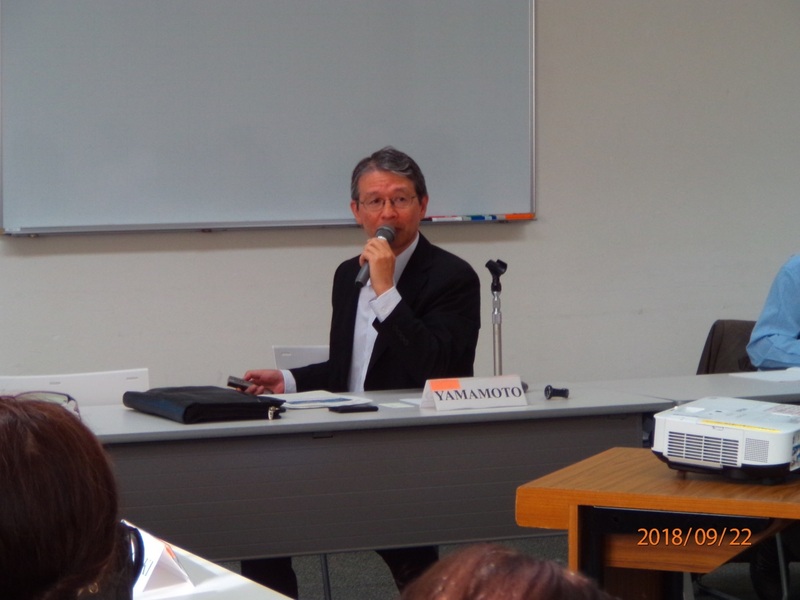 At the end of discussion, Professor Sukehiro Hasegawa identified four salient points made by participants and a major challenge Japan would be facing in the forthcoming years. First, most of massive terrorist acts are committed for political, ideological and religious reasons while individual acts of violence are caused by personal and psychological reasons due to social alienation. Second, some governments engage acts of “state terrorism” against foreign targets or even its own citizens, in the pretext of combating terrorism. Third, in preventing and countering terrorism, a comprehensive approach should be pursued not only enhancing technical and institutional capabilities but also preventing the radicalization of extremist ideas and behaviors and supporting socio-economic development. Fourth, Japan has been successful in avoiding terrorist acts mainly due to a tolerant attitude of the society. 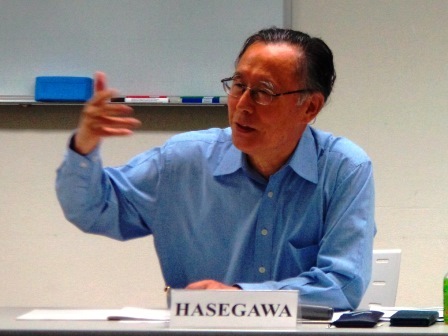 After identifying the four points, Hasegawa recalled the Shimabara Rebellion that took place in the 17th century Tokugawa Era which resulted in the massacre of more than 25,000 mostly Christians, although the cause of revolt by local population was the grievance against high taxes. He then asked whether Japan could indeed sustain such a tolerant attitude to foreigners of different ethnic and religious affiliations who would eventually come and reside in Japan in order to sustain Japan`s economic and social viability.